I recently received a call from a man named Mark who is the GM over at Dâ€™Amico Catering in Minneapolis. He used to work at the Edina Dâ€™Amico and over the years, delivered 100â€™s of boxed lunches to QBP. 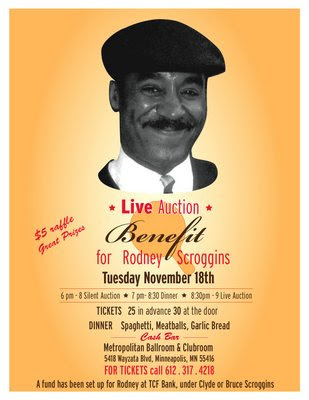 On September 17th, 2008, Rodney Scroggins, (who has worked for them for 19 years and has always biked to and from work), was hit by a car (hit and run) and found lying in the road about an hour later, then brought to HCMC. He is still in the hospital and recovering from a dislocated shoulder, broken bones and other injuries. Coworkers have organized a benefit to help with his recovery. All the proceeds will benefit his family. When: Tuesday, November 18th 6 p.m. - 9 p.m.
Mark wanted some help spreading the word, I said Iâ€™d see what I could do. Please consider supporting, attending or telling your friends about this incredibly important event.